Nerdy Nummies hosted by Rosanna Pansino is a YouTube series dedicated to making pop culture treats from everyday ingredients. Confections like a chocolate and vanilla chess cake, Hello Kitty caramel apples, Minecraft rice krispie treats and a patriotic Captain America cake are just a few tutorials she offers. Most recipes are easy, accessible, and absoloutely creative. Pansino has definitely found her niche in the food world and with a over a billion fans, you know she is doing something right. 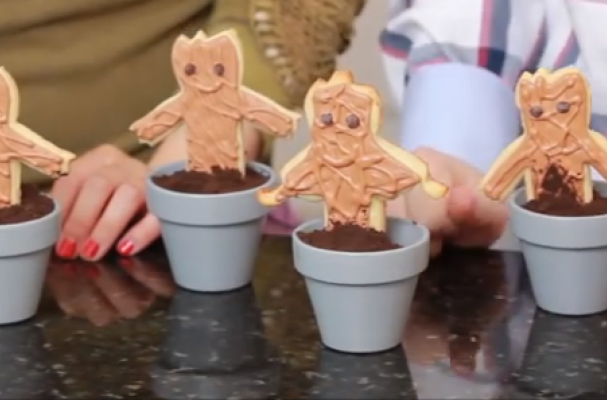 Cut to the Guardians of the Galaxy Groot cookies - another easy tutorial that intersects superheros and baking. These sugar cookies are made from a store bought mix but you can certainly use your favorite recipe for homemade sugar cookies. Groot, a tree-like creature, is shaped using a classic gingerbread man cookie cutter. He is decorated with brown icing to give the appearance of bark and mini chocolate chips form his eyes. The cookies are "planted" in a small flower pot with brownies and Oreo cookie crumbs. If you are a fan of the comic book series, the movie, or both, you are going to love this fun recipe.